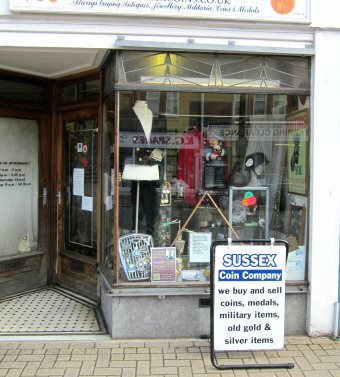 Sussex Coin Company have been established in the same shop in West Worthing since 1968. Our small shop is laid out like a museum with items we have acquired over the years. We pay the highest prices and offer free advice. Home visits can also be arranged for your convenience. or if you have questions. Actively looking to buy gold and silver coins and will purchase items from any country in the world. Milled or hammered coins, collections or obsolete coins, we also purchase old banknotes, domestic and foreign. Top prices paid for pre-1947 English silver. We are always keen to acquire original militaria. We will purchase medals, swords, daggers, bayonets, helmets, badges, buttons and other war souvenirs. Also keen to buy jewellery and other Victoriana, snuff boxes and pocket watches to aviation, nautical and railway items. We pay best prices for cigarette cards, postcards, old photo albums, binoculars, telescopes and fountain pens. Why not visit our shop.